Does your little one know how to make an entrance? It can be done in a number of ways! She could be the type to flop into a chair with a silver screen style sigh and a dramatic story. Maybe she's always singing and dancing like you're living right on Broadway on a daily basis. If she's really got game she walks in surrounded by bluebirds and squirrels that are trying to fix up a fancy gown for her. Well, that entrance would be super messy, somewhat wierd but it also would be pretty sweet! 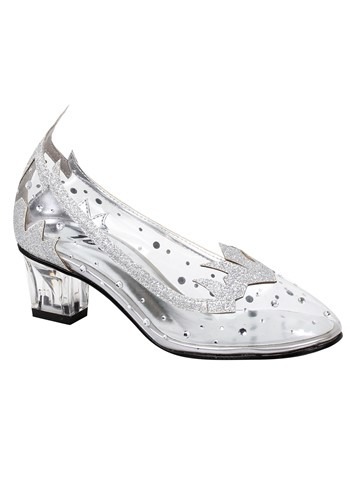 These silver glitter shoes are sure to make her entrance breathtaking. They are perfect for twirling, dancing, and taking that special bow. She's going to love the cool sparkly accents and rhinestones on the clear base. Perfect with that blue dress or with that jazzy sparkly leotard. Hey, these heels might even up her entrance game. Are you ready to install a trapeze in your house?